Gem stones — Christina Made It. I had a custom request from a friend of mine to make a matching bracelet and earring set for his wife's birthday present. The bracelet was to replace one that had been previously lost, so it was important that it had similar elements. Working closely with the customer on the design, it was decided that we should include the blue gem stones that were in the lost bracelet and also the figure 8 shape that appeared in the links. 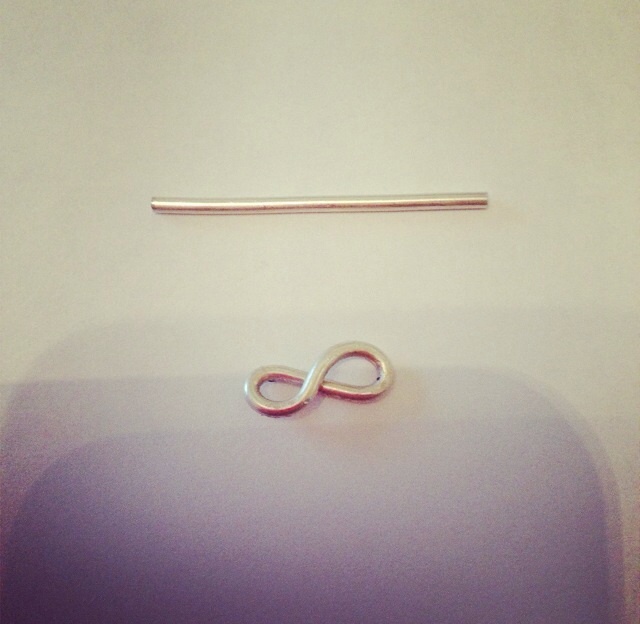 It seemed fitting to use the infinity symbol for its representation of eternal love. The links started as round wire, which was cut to size. The ends were filed flat to give a neat join and then bent into shape using pliers. This did take a bit of trial and error, but the great thing about silver is that you can reuse it - if it doesn't work, you can make it into something else and if you damage it you can usually polish it out. The join was then soldered together using silver solder and a blow torch. 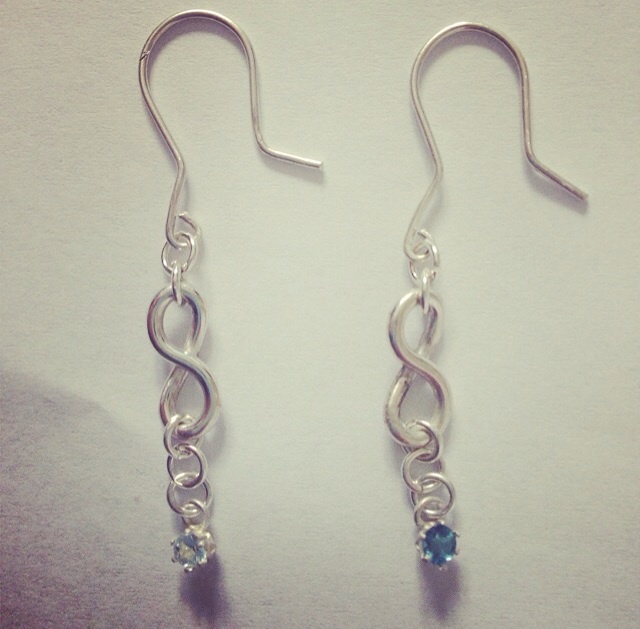 I made ten of these; two for the earrings and eight for the bracelet. All the links were then sanded down and polished to smooth out the joins. 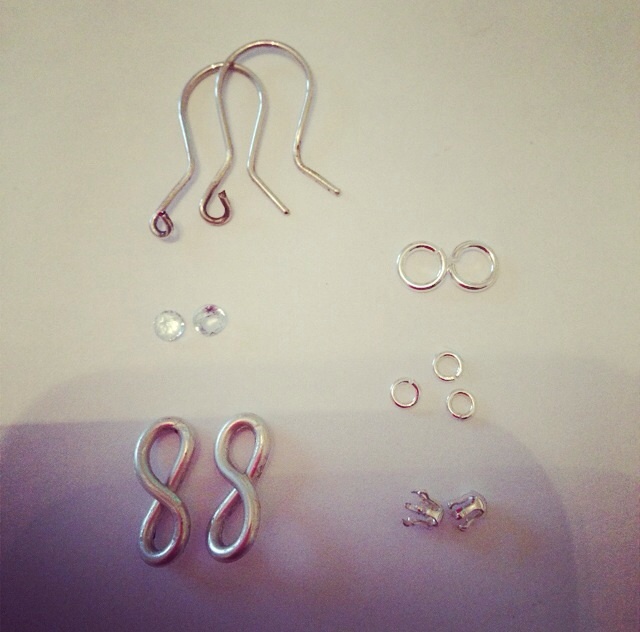 The earring hooks are made from 0.8mm round wire which is the standard thickness that most people can fit through their ears. Again these were shaped with the round nosed pliers. The curve was created by wrapping the wire around a pen (or similar) which gave a neat arch. This was my first time using gem stones so I had to research how to incorporate them into the jewellery and how to set them. I will admit I did panic slightly when I realised it was a whole different skill to silversmithing, but the general idea was a need for a kind of claw that can hold the stone in place which can then be adjusted to hold it securely. The stone choice was topaz - a suitable option as it represents love and relationships. We originally chose the Sky blue topaz, but when they arrived they seemed a much more pale blue than in the picture. So we tried the London blue topaz instead which were a much closer match to the original bracelet. I then added the various sizes of jump rings to join each of the links together as well as the clasp mechanism to the end. With the unused Sky blue topaz stones, I created some stud earrings. These also allowed me to practice how to set the stones before I worked on the real thing.